Are Santos playing hopenomics with their oil price projections? Australian oil and gas giant Santos has been using forward price estimates that are significantly higher than other industry players and reputable brokers. 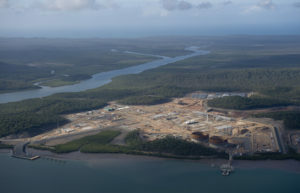 Curtis Island LNG plants near Gladstone QLD. 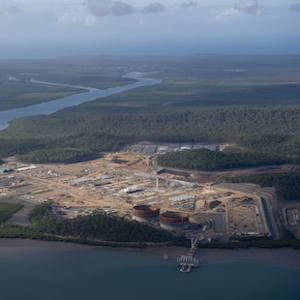 Santos’ GLNG project is one of three at the site. Credit: GreensMPs. With the likes of Deutsche Bank, Goldman Sachs and Santos’ own industry consultants Wood Mackenzie all projecting much lower oil prices, it’s hard to understand the basis for Santos’ optimism. On 18 August, the Adelaide-based energy company reported a huge first-half loss of US$1.1 billion (around AUD$1.4b) after taking a writing down the value of its high-cost Gladstone Liquified Natural Gas (GLNG) export project in Queensland by US$1.05 billion. A loss of that magnitude is staggering in anyone’s language, but the GLNG pain could be far from over for Santos, which may have significantly overestimated the price it will be able to recover for LNG sales in the future. Our analysis shows that if Santos had used the same price projections released by industry peer Beach Energy yesterday, the company would face an impairment of US$4.9 billion between 2017-2021. Unlike other markets – such as the US, where the SEC prescribes a standard oil price projection – Australian oil and gas companies are free to set their own estimates. This significantly influences asset values. Comparing Santos’ estimates to those provided by Deutsche Bank, Wood Mackenzie, Goldman Sachs, Canaccord Genuity, the World Bank and BMO Capital Markets for the five years 2017-2021, no broker matched the Santos estimates more than once. For 2017, Santos’ projection of US$60 per barrel is higher than five of the six brokers, with only Canaccord Genuity projecting the same price. According to their own sensitivity analysis, Santos will take a US$600 million hit for every US$5/bbl that oil prices are below its estimates. For the period 2018-2020, Santos is between US$6-15/bbl above the median forecasted price of selected peers and brokers, a difference in reserve values that would see a multi-billion writedown based on World Bank oil price estimates. With Santos’ forward price projections for oil clearly and consistently amongst the most optimistic for the coming years, investors have every right to be questioning the veracity of these estimates. Sadly, Australia’s weak regulatory system is giving companies leeway to potentially mask serious risks to future revenues. While Santos is one of the worst examples, they aren’t alone in having announced huge losses this reporting season. Other major fossil fuel players including BHP, Wesfarmers and AGL have all written down the value of dirty coal and gas projects. Check out our post tracking the biggest fossil fuel writedowns of 2016.